It looks like I bumbled a bit with my post about Conversing with the Bumblebees. I actually was talking with a carpenter bee! We recently hired a landscaper, and it's been nice to delegate some of the heavy garden chores now that I'm 5 months pregnant. They did a really nice job mulching and weeding this spring, and the lawn looks great. It was also nice not to be the one to get poison ivy while weeding the beds in the backyard. Bumblebees and carpenter bees look similar, so it's easy to confuse them. 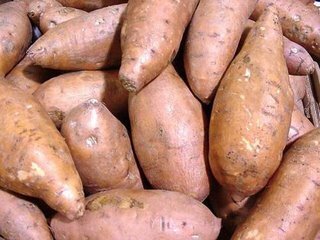 Here's how to tell them apart. 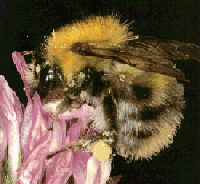 Bumblebees have furry abdomens that often have some yellow. These two bees are also sometimes confused with honeybees. The honeybees look quite different, however, when you look closely. Check out Judith's blog to take a peek inside the bee hives. Although I didn't get the bumblebees I'd planted for, these insects are natural pollinators and don't seem to be much of a nuisance. I haven't seen any noticeable damage yet. Also, like bumblebees, they seldom sting. In fact, the male carpenter bees don't even have stingers. The females rarely sting and will leave you alone unless you mess with them. 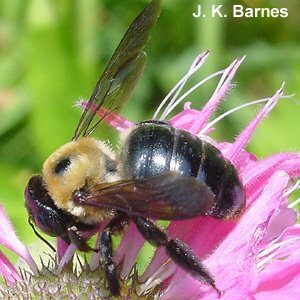 Despite their lack of stingers, males carpenter bees tend to be aggressive when you near their nests. So that's probably why the little bee was pestering me when I was planting my columbine.